Spiti in September – How to Best Plan Your Journey? September is widely considered as one of the best times to visit Spiti valley. There are several reasons behind this which I will further discuss in this article; but the biggest reason is of convenience. This convenience could be in terms of roads, hotels, vistas, weather or something as simple as tourist rush. I am not saying that this is the perfect time when you will not face any challenges at all. No, but a journey to Spiti in September means that the hassles that you may face in some other months may either not be present at this time; or at least the intensity will be a bit less. So why September? I will begin with the reason that matters the most to majority of the people traveling here. That is of the challenge and scenic beauty. Monsoon in Himachal arrives sometime in July and remains until August. Rains breathe life in to the valleys that remains missing for rest of the year. 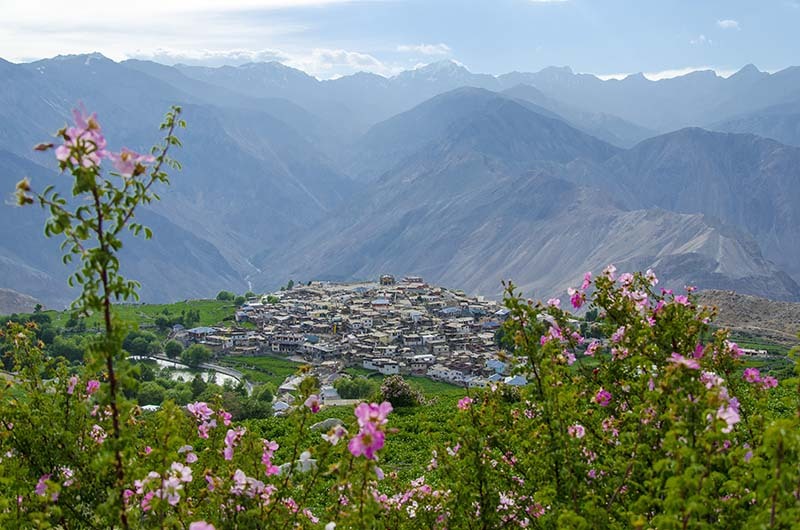 Lush green valleys with flowers of numerous colors blossoming all around; and patches of clouds floating over is a view that you will only find during monsoon. But then the risk of incessant rains and resulting landslides is also the most in July and August. On the other hand, when you go to Spiti valley in September; monsoon would be long gone but all the lush green in the valleys of Shimla, Kinnaur and Manali would still remain. You will still be treated with the same mesmerizing vistas but would be able to enjoy them better. Contrary to common belief, Spiti valley actually remains open for tourism throughout the year. Traveling from Shimla, you can reach Kaza even in the months of January and February; and that is how a lot of people plan their winter trip to Spiti. It is the route from Manali to Kaza that remains open only from late May till early October; and closed for rest of the year; after it starts to snow at Kunzum and Rohtang Pass. But if you went in the months from January till April; you will first of all be facing freezing temperatures. Life in Spiti in winter is harsh and you will become a part of it for a few days; which is not really everyone’s cup of tea. You will also not be able to be able to travel on entire Spiti circuit and will have to limit your trip to Shimla side only. In the months of May and June; you may be able to travel on both Shimla and Manali routes; but hills at this time will be a bit barren. Greenery will largely be missing which you will then find in July and August but then these months also pose the risk of non-stop rains, slush and landslides. From October till December, it will start to get cold again; Manali – Kaza route will close and hills will turn barren again. And this is why they tell you that September is probably the best time for Spiti valley. All roads will remain open; it will not be terribly cold; you will find plenty of greenery around and will be able to travel on complete circuit. After the good part, let me also talk a little about the negatives of being on Spiti circuit in September. Your biggest problem will be of water crossings en route. While the rains in August would have ensured plenty of eye-catching vistas; it also would have resulted in increased water flow in nallahs on the way. Between Shimla and Kaza, the biggest one is the Malling Nallah after Nako. Between Kaza and Manali however, there are numerous of these water crossings; majority being between Gramphoo and Batal. Some of these water crossings will just be small water puddles; but a few others would have turned into large monsters after monsoon. While getting across, stop for a minute and take a judgement of the flow of the water and depth. If you are not sure whether or not you will be able to cross; wait for another vehicle to arrive and follow its lead. In peak tourist season, plenty of local taxis travel throughout the route. If you weren’t feeling too confident, then wait for a local cab to arrive and the follow it. If you were traveling by a car then ensure that you are bringing one with high ground clearance. It doesn’t necessarily have to be a 4×4 SUV but a good ground clearance is must. When I say good, I mean a minimum of 180 MM. Do not even think about traveling to Spiti valley in a Sedan like Honda City or Skoda. If you were traveling by a hatchback like Maruti Swift, then you can consider bringing it here but will have to be extremely careful. My recommendation would be to avoid bringing a hatchback or Sedan altogether to Spiti in September. “Larger the engine the better” is the mantra for terrains like Ladakh and Spiti. It doesn’t mean however that you cannot bring a 150CC bike here because you definitely can. The only thing to remember is that if you were traveling with a pillion then opt for a bigger engine. You need to remember that it is not only 2 people; but all their luggage as well that you will be carrying around. If you were bringing a 125CC or 150CC bike then it would be better to ride solo. In either of the cases however, ensure that you get your bike well serviced and prepared for the ride ahead. It starts to get a little cold in Spiti valley by September. Days will be sunny but there will be a definite chill in the air. As the month progresses, the weather will shift tremendously by each passing week. Cold will start to settle in and by mid September, it would have snowed at top of the surrounding peaks which will cause the mercury to drop at an even faster rate. Chandratal will be even colder than this. Temperature here would remain close to 0 degrees Celsius even at starting of the month. Towards end of September, it will start to drop several degrees below 0 at nights. Temperature during first week of September will fluctuate between 15 Degrees Celsius at day and 5 Degrees Celsius at night in Kaza. In neighboring areas like Kalpa, it will be between 10 to 20 Degrees Celsius. By Last week of September, this temperature would have shifted to between 10 Degrees Celsius at Day and -5 Degrees Celsius during night in Kaza and Tabo. In Kinnaur valley, temperature at end of September would be between 15 Degrees Celsius at day and 5 Degrees Celsius at night. Which then brings us to our next question; what kind of clothes should you be packing for Spiti trip? Looking at the weather estimate above, I will say that if you were traveling in early September; then carry plenty of cottons, some lights woolens and a heavy windproof and warm jacket. Ensure that your jacket has a hood to it that can help protect your neck, head, ears and face. If there is no hood then better pack a cap and muffler as well. If you were however traveling towards late September then you will have to bring in your woolens. It is not just the temperature but also the wind that you will have to protect yourself against. If you were planning a motorcycle trip then you will have to completely windproof yourself starting from your head to hands to torso to feet. To be honest, no matter which month you travel in here; you should keep your hopes low in terms of road conditions in Spiti valley. Your biggest worry will be the stretch between Manali and Kaza and the water streams here. Starting from Manali, the road until Gramphoo via Rohtang is a mix of good and bad. From Gramphoo till Kaza is a complete nightmare including the 14 kilometers long road to Chandratal. From Kaza till Tabo is just about average. Tabo to Nako and then Khab is mostly good. Khab to Pooh is a mix of good, bad and really ugly. Pooh to Rampur and then Shimla is a mix of good and average. This becomes a major concern if you were traveling towards late September. What is Black Ice? It is water or moisture present in the roads that freezes overnight and turns into a very thin sheet of ice; practically invisible to the eye. You won’t realize there is black ice on the road until you are on it and sent skidding. To be on a safer side, if you were traveling in last week of September or early October; wait for the sun to come up before starting for the day. A little bit of sunlight will ensure that the black ice has melted away. It may be considered as the end of it but the month of September is still tourist season in Spiti. So all hotels and guest houses will still be operational. No matter what your budget is, you will easily be able to find a place here to stay. When I say budget, just to be on a safer side, assume a minimum of Rs. 1000 per day as your accommodation cost. You could find hotels priced cheaper than this as well but assume around Rs. 1000 to Rs. 1200 as your minimum expense. Whether or not to book in advance is completely your own choice. I am myself more of a guy who would arrive at a destination; find a hotel per liking and then negotiate an on the spot deal. However, if booking in advance gives you your peace of mind, then you may opt for advance booking. One advantage of traveling to Spiti in September is that you may get better deals in terms of accommodation. Since the tourist season will be approaching an end, there won’t be many tourists around; and hotels will be prone to lower their asking price; depending upon your negotiation skills. The camp sites at Chandratal usually start to wrap up by October first week. In September however, they will all be completely operational. If a night stay at Chandratal was on your itinerary then please make sure that you are prepared for some extreme cold weather. If your trip was towards late September, then chances are that temperature will remain close to 0 even during day. Winds at the lake are mostly at high speed; and due to the glaciers all around, you are bound to feel the chill. Carry a good quality warm windproof jacket that you can put on for walking around the lake. Snow in September will mostly be limited to the top of Kunzum Pass and Rohtang Pass; or at the top of the distant peaks. You will not find any snow in lower areas at all. If you were however traveling towards late September or early October; and were extremely lucky; then you may actually catch a live snowfall at either Kunzum Pass or Chandratal. It heavily depends on the weather though and chances are a bit rare. Snowfall at Chandratal starts sometime by October; and by December in lower areas of Spiti. For a Spiti trip in September, my advice would be that you plan in early part of the month. By September end, it would have gotten way too cold and you may not enjoy the trip as much. If September end is the only time you could go then first of all check the weather forecast. Second thing is to pack proper clothes and prepare for the cold weather ahead. You may also want to bring in a good cold cream and some lip balm. Also pack some common medicines for flu, cold, fever, headache, upset stomach etc. There is really no need to buy any specific shoes for Spiti valley trip. Your normal sports shoes will do just fine. You don’t need some expensive trekking shoes unless you were planning on heading out on a trail for a few days. For a regular trip, your regular shoes will do just fine. You may find it hard to believe but during my latest trip to Spiti valley; I traveled on the entire circuit in bathroom slippers. My shoes just remained in the car for all 10 days while I drove and walked around wearing my slippers. They were just so comfortable that I didn’t want to put the shoes on. Finally, one of the slippers broke while I was circling around Chandratal and walking up and down the hills. Even then I did not put on the shoes and spent the last 2 days wearing my Crocs. So the point I am trying to make is that you do not need to waste more money buying shoes that you do not need. Just bring your normal sports shoes and you will be fine. If you were riding a motorcycle, then I would recommend bringing Rubber Sandals, like Crocs. Opt for something that can cover your entire feet. That way, when you cross a water stream, you can just put on the sandals. You will get across without wetting your shoes, or hurting your feet and the sandals will just take a minute to dry again. Also Read: How to Calculate Cost of Spiti Valley Trip by Motorcycle? Both Lahaul and Spiti Valleys remain open for your tourism in the month of September. Depending on the time you have in hand, you can either plan a trip to Spiti or both Lahaul and Spiti. To clarify this a bit further since a lot of people tend to get confused, Lahaul and Spiti are two different valleys. Spiti is the region around Kaza and Chandratal whereas Lahaul is the area around Keylong and Udaipur. They are not both one and the same place. This is one great benefit of visiting Spiti in September. There will definitely not be too many tourists around. Most of the people who were planning on Spiti trip that year would already have traveled. Spiti is anyways a very remote region where not many people go but in September, number of tourists will be even less. This will help you get a better deal on hotels, renting motorcycles and an overall great benefit for people who want to stay away from crowd for a few days. And that is all that you really need to know about visiting Spiti in September. I hope the information above was of help. If you feel I have missed adding somedetails here, please feel free to ask or suggest it in the comments section below; or at our Community Forum; and I will be gad to answer. I am planning to take zoomcar to spiti next week. Is that ok? Where can I find ATMs on the way? Also where can i find Petrol Pumps On the way? What is the current situation of Shimla route to spiti? We are planning a trip in 2nd and 3rd week of September. Hi Meera – Rains area wreaking havoc right now around Shimla, Kinnaur and Manali. The road was closed for a few days last weeek but open as of now. Will it be possible for us if we leave at dawn from KAZA for CHANDRATAAL and then the same day reach Manali (on bike) ? Hi Vargis need urgent jelp. We are traveling to Spiti tomorrow from Delhi..do u have any idea about road closures or land slides in that are? This is very informative Vargis. I am planning to visit in the 2nd week of Sept and hopefully this article will be helpful. I usually prefer traveling with all pre booking but this time I want to try a few places go and pick basis. If possible, please can you suggest a good car agency/driver. I won’t be rratravel via Simla or Manali, rather to reach NARKANDA directly from Delhi. Getting a bit confused since a few people saying that taking cab from Delhi is not a good decision. Your advice on this would be helpful. Hi Indrita – Yes, taking a cab all the way from Delhi is just additional cost for no reason. A better choice would be to board an AC bus to Shimla or Manali and have a local driver pick you from there. Then take a direct bus to Manali and board a cab there. Just make sure that you have the cab booked in advance and the driver is keeping the Rohtang permit arranged. Thanks for the info Vargis. If you have any reliable contact of cab, please help me with that. Also if you can give me brief idea on what can be daily charges and one major thing, if there are any areas with major oxygen deficit is there. You can contact Binny Thakur at 9816300804. If that did not work then try Jamaica at 9418200183. You are right Mrs. Jain 🙂 I am sure that your experience of Spiti will be a memorable one. hi vargis vai.i am much diappointed. is spiti velley is a restricted place for bangladeshi this year? my trip wil highly depend on your comment. I have heard that there was a problem with permits for Spiti as well. But it is not as much as Ladakh. That is why I said to better plan for next year. The time has come to book a taxi for our 9 day trip to Spiti valley.Can you please suggest a taxi agency /driver? Please try talking to Binny Thakur @ 9816300804. If you are not able to workout a deal with him then please contact Jamaica @ 9418200183. Am going to make an advance to Binny Thakur today. He would be able to give a receipt for payment received? You do vouch for him, don’t you? Hello Mrs. Jain – I am sorry but I can’t really vouch for anyone. These are contacts that I made while traveling around myself. Only assurance I can give is that I have give their contact details to other travelers as well and no one has come back with anything negative so far. My friend and i want to go Chandratal from Chhatri or Batal, after doing Hampta pass. How do i do that? Please send the transportation details. There is no transport available from Batal to Chandratal. You will either have to hitchhike or walk 14 kilometers.